Welcome! We always need more WoW players! Welcome to ADK Our overwatch section are very welcoming to new people! 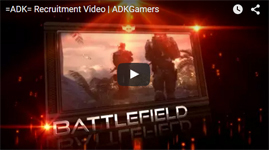 Welcome to ADK Our EFT staff will certainly be excited to have more players! Hello, fellow ARK players! As of next Friday, August 31st, the staff is excited to present its first wyvern farming event! We will be farming for both eggs and milk, which will be split equally among everyone at the event. It is encouraged that everyone brings their own gryphons or wyverns. We do have 1 or 2 to spare if somebody does not have one at home. If a participant has neither, that's totally okay. The ones without them can help tranquilize and kill whatever we fit into the trap! The event will take place on our Ragnarok server, around 5pm CST. We hope to see you there! Welcome to the ADK family you should post pictures of your cat sometime!! Welcome to ADK We’re always happy to get new league players. Welcome to ADK We’re happy to have you! Update: Aug 4 @ 8:13pm ● Fixed remaining mating time display in Dino Soul descriptions. ● Added a mating indicator bubble in the bottom right of the Dino Souls. Red, yellow, and green to match the respective mating statuses of can't breed, waiting to breed, and ready to breed: https://gyazo.com/accc7d78e672463b1ad75439acd733a3 ● Potential fix for the rarely occurring odd bug where dino's may fail to be trapped because the dino inventory is full, even when there's nothing in the dino inventory. I couldn't get the issue to occur but I added another OR statement check. Let me know if it creeps in again. ating time display in Dino Soul descriptions. ● Added a mating indicator bubble in the bottom right of the Dino Souls. Red, yellow, and green to match the respective mating statuses of can't breed, waiting to breed, and ready to breed: https://gyazo.com/accc7d78e672463b1ad75439acd733a3 ● Potential fix for the rarely occurring odd bug where dino's may fail to be trapped because the dino inventory is full, even when there's nothing in the dino inventory. I couldn't get the issue to occur but I added another OR statement check. Let me know if it creeps in again. Welcome What kind of games do you play? Welcome to ADK ^^ We're happy to have you!